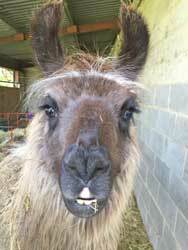 All these llamas are available for adoption – see our adoption page for more details. Meet FINLAY who is a home-bred 12 year old gelding. 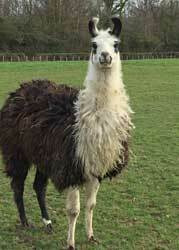 Until recently he was a stud llama and was up for sale. 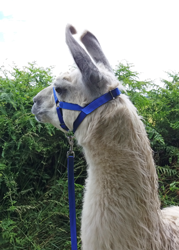 However, we didn't manage to sell him as a stud so he has been castrated and he is an absolutely fantastic trekking llama. He is very calm and friendly and really enjoys his walks. He is not too big so is ideal for somebody who might be a bit intimidated by size. We had 2 cria from him and they are so cute! Carla in particular really looks like him! Meet JUNO who is 14 years old. 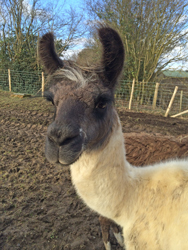 Juno is actually one of our stud llamas but due to his lovely laid back temperament, he makes a delightful walking companion. We think he likes time away from the girls as they all nag him!! 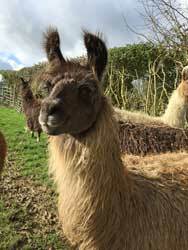 Meet DOMINIC who is a new addition to our trekking team. He is only 6 years old but is proving to be a very brave and interested boy in the walks. 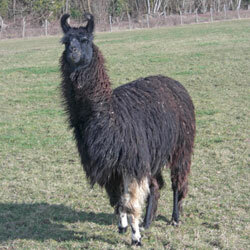 He is yet another son for Black Jack and his Mum is Sunshine. Meet DARCY who is also a new addition. Again - he too is only 6 years old. Not quite so brave as his brother, Dominic, but practice makes perfect! Also Black Jack's son and his mum is Lavender. Meet NICHOLAS who at 15 years old is very lively and likes to go off at a brisk pace, but for those who prefer a more sedate stroll, keeping him at the rear of the pack definitely reins him in! 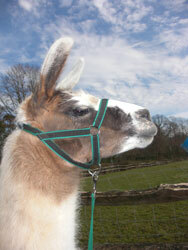 Meet PLATINO who is 12 years old and we have owned him for several years now. 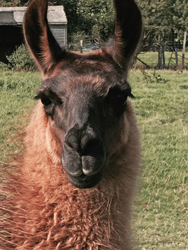 He is in fact a stud llama, but has such a lovely quiet personality that we have decided to use him for trekking as well. In this photo of him he has a very short fleece as he had just been sheared, but normally he has a very thick and woolly fleece! 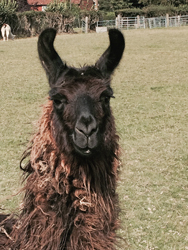 Meet GABRIEL who was born in 2016 to very proud parents Jo-jo and Drizzle. 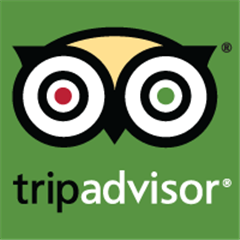 He in fact joined our trekking team last year and for his age is very sedate and such a good boy to handle. He is very keen on homing in for kisses which is probably his greatest attribute! Meet GOLIATH who was also born in 2016 to Lavender and Black Jack. Goliath is actually the last baby born to Black Jack. He also started trekking last year but really needs to get a few more miles under his belt as he tends to worry about things. He only did a small amount of trekking last year as we felt he needed to mature a little bit more. Hopefully this will have paid off. Time will tell!